Participants take to the track at the start of Relay For Life in Fairfield. This past summer, several Solano County cities held Relay for Life events, to raise funds for the American Cancer Society (ACS). NorthBay supported the fund-raising efforts by fielding teams of walkers for the 24-hour marathon event, and providing educational materials and first aid kits to hand out to participants. In Fairfield, a Relay for Life was held in July at Solano Community College, and as many as 85 teams participated, according to Kim Shupe, relay manager for ACS-Solano. “It was a good event. We had good weather and a lot of educational pieces on cancer detection and prevention to hand out. We also were able to honor about 230 cancer survivors. 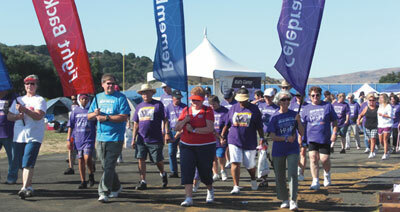 NorthBay assembled two teams of employees to walk at the Fairfield Relay. Despite a decrease in donations and the overall number of participating teams, Shupe noted, walkers were still able to raise more than $135,000 during the Fairfield event alone. Relays for Life events have also been held in Vacaville, Rio Vista, Dixon and Vallejo. 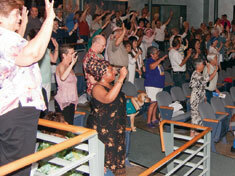 The joy of cancer survivorship was evident June 7 when more than 300 survivors and their loved ones met in Fairfield to celebrate National Cancer Survivors Day. This was the 13th annual “Celebration of Life” sponsored by NorthBay Cancer Center and the American Cancer Society-Solano Unit. The program began with NorthBay Cancer Center Medical Oncologist Brian Vikstrom, M.D., who presented a cancer research update. Keynote speaker Lori Bremner, an American Cancer Society “Hero of Hope,” shared how a leukemia diagnosis 30 years ago changed her life. That sentiment continued as four other cancer survivors—Jack Biederman, Christine Franklin, Kathy Van Riper and Mark Van Riper—”spoke from the heart” about the challenges they face fighting this disease. Courtyard activity included everything from on-site massage therapy and marking luminaria bags to viewing the cancer survivor quilts. “As always, wonderful! I wouldn’t miss it for anything, even though it’s a 75-mile drive,” one program review noted. “Thanks for an uplifting day,” wrote another. Next year, Cancer Survivors Day is Sunday, June 6.